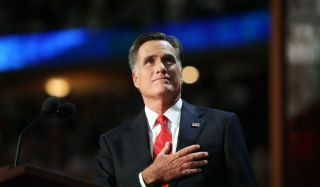 Mitt Romney accepted the Republican presidential nomination at the 2012 Republican National Convention in Tampa, Fla.
Republican presidential nominee Mitt Romney has unveiled his plans for the future of NASA and American space exploration, unleashing a blistering attack on President Barack Obama in the process. In a policy paper released Saturday (Sept. 22), Romney and running mate Paul Ryan pledge to secure the nation's global leadership position in space, which, they say, has eroded significantly during the president's first term. "Over the past four years, the Obama Administration, through poor policy and outright negligence, has badly weakened one of the hallmarks of American leadership and ingenuity — our nation’s space program," the paper reads. The paper says Obama's 2010 cancellation of the moon-oriented Constellation program robbed NASA's human spaceflight program of much of its focus and direction. Romney and Ryan promise to restore that focus — but they're unlikely to increase NASA's funding, which stands at $17.7 billion in the White House's proposed 2013 federal budget. "A strong and successful NASA does not require more funding, it needs clearer priorities," the paper reads. "Romney will ensure that NASA has practical and sustainable missions. There will be a balance of pragmatic and top-priority science with inspirational and groundbreaking exploration programs." No further details about these prospective science and exploration missions are provided. Indeed, the eight-page document is sparing with details throughout, saying that specifics will be drawn up later, after consulation with representatives from NASA, the Air Force, academia and the business community. Instead, the Republican nominee promises broad commitments to work with international partners, strengthen America's national security space programs — including "the development of capabilities that will deter adversaries seeking to damage or destroy the space capabilities of the U.S. and its allies" — and revitalize the nation's aerospace industry. Romney and Ryan also say they'll encourage the continued emergence of the American private spaceflight industry, which they feel NASA should rely on for crew and cargo flights to low-Earth orbit to the extent possible. This last vision is similar to the one the space agency is already embarked upon. NASA is currently grooming private American spaceships to fill the shoes of the space shuttle fleet, which was retired last year. One company, California-based SpaceX, is set to launch its first contracted cargo run to the orbiting lab for NASA on Oct. 7. And the agency hopes at least two different commercial vehicles will be ready to fly crews to and from the International Space Station by 2017. Meanwhile, NASA is developing a huge rocket called the Space Launch System and a capsule known as Orion to carry astronauts to a near-Earth asteroid by 2025 and the vicinity of Mars by the mid-2030s — goals laid out by Obama in 2010. But until the commercial astronaut taxis are ready to go, the nation will be dependent on Russian Soyuz spacecraft to launch its crews to low-Earth orbit. And the Romney-Ryan campaign lays a great deal of blame for this situation on the current administration. "We have presided over a dismantling of the space program over the last four years," Ryan, a Republican congressman from Wisconsin, said during a speech in Florida on Saturday. Obama "has put the space program on a path where we are conceding our global position as the unequivocal leader in space," Ryan added. "Today, if we want to send an astronaut to the space station, we have to pay the Russians to take them there. China may someday be looking down on us from the moon. That is unacceptable."